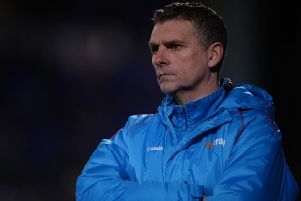 With just four days to go before the transfer window shuts, boss Keith Curle believes the Cobblers need an attacking 'focal point' as well as more experience 'in key areas'. The Town manager has cut a relaxed figure when it has come to recruitment over the past few weeks, and he isn't about to start panicking now ahead of the window closing at 11pm on Thursday. But after Saturday's hugely frustrating 1-1 home draw with third-from-bottom Morecambe, Curle hinted there will be players coming in and that he would like players who are hardened when it comes to playing in Sky Bet League Two. His three signings to date have all been young loan players, with 21-year-old George Cox coming in from Brighton along with 20-year-olds Joe Powell, from West Ham, and Timi Elsnik from Derby County, the latter two making their debuts at the weekend. With Town still far too close to the relegation zone for comfort, and having won just two of their past 12 league two games, Curle, who has plenty of funds at his disposal to strengthen the squad, admits he may need a few older heads in the building. The average age of the 14 players used by the Cobblers on Saturday was under 24, with second half substitute Andy Williams the only player aged over 30, and Ash Taylor and Daniel Powell the only outfield players older than 25. "That was a young squad out there," admitted Curle. "We had two new players, and one of them (Elsnik) only had one training session on Friday. "What we need is a little bit more experience in the squad, in key areas." One of those key areas, according to Curle, is in attack, where he feels the team is lacking a 'focal point'. Town sold leading scorer Kevin van Veen to Scunthorpe United earlier this month, while Andy Williams has been in and out of the team. Junior Morias played as the central attacker against the Shrimps and did a decent job, but Curle said: "I think we need a focal point. "As a centre forward, we need a focal point, that we can go and play off, somebody who is reliable, consistent, dependable. "That gets people of the front foot, and at the minute we get a little bit tentative when we turn and go forward. "We are not looking for the right pass, and then as soon as you have another touch then options change. "So we need to move the ball quicker in midfield, and we need reliability, consistency and dependability as a focal point, and goals as well." Asked if there are likely to be comings and goings over the next few days, the Town boss added: "It won't change. "Myself, Simon (Tracey, head of recruitment) and the other members of staff, we are looking to identify players we think fit into our structure, fit into the dynamics that we want to bring as part of the foundation for us to move forward. "That hasn't changed from day one, when we walked in looking for improvement."